Whoever came up with brunch is a genius. Sure, hygiene it just a late breakfast, sickness but it’s a late breakfast with Mimosas. And if you’re at my house, website it’s a late breakfast with Guamosas. That’s not a typo or some weird baby talk. Guamosas are Mimosas made with guava juice instead of orange juice and they are absolutely amazing. Nothing says celebration on a Sunday quite like a Guamosa. If you can get your hands on some guava juice (or guava nectar), I highly recommend you make some as soon as possible. And if you share them with friends, they’ll love you forever. Now, onto the more sensible and commonplace part of brunch – eggs. If you’ve ever made brunch for a crowd, you know how impossible it is to get the eggs just right. Everyone’s crowding around drinking Guamosas while you tend to a pan of eggs, making sure not to overcook them. I’d rather be drinking Guamosas than standing in the kitchen tending to a skillet, so I usually make a strata, which is basically a very eggy bread pudding with cheese on top. Everyone loves it and your oven does all the tending while you socialize. The only thing missing for me is a beautiful soft yolk. I do like my drippy, glistening yolk. So I tried combining the awesomeness of a poached egg with the easiness of a strata in these baked eggs. This is experimentation gone right. These little ramekins are pure delicious brunch-iness. Bread, heirloom tomatoes, sun-dried tomatoes, spicy Spanish chorizo (or ham or bacon or sausage), a little cream, a cracked egg and a generous pile of Gruyere. The tomatoes and cream soak the bread and make it the perfectly creamy, tangy base for chorizo and drippy yellow yolk. And the cheese is browned and melted and there’s nothing better than that. These will definitely be making an appearance at Easter Brunch on Sunday and they just might outshine the Guamosas! ps. Last day to vote! I forgot the chives in the recipe this time. They would have been much prettier with the flecks of green! Preheat the oven to 400°. While the oven is preheating, brown the chorizo (or ham or bacon or sausage) in a skillet. Once it begins to brown, remove from heat. Carefully cut the baguette into 1/2-inch pieces. Set aside. In a bowl, combine the chorizo, tomatoes, sun-dried tomatoes and cream. Grease the ramekins and divide the bread cubes evenly amongst the ramekins. Spoon the chorizo and tomato mixture over the bread. Crack one egg carefully over each ramekin, keeping the yolk intact. Top each ramekin with grated cheese and a sprinkling of chives. Bake for 10 – 12 minutes or until the egg whites are set and the cheese is golden. Makes 4 – 8 servings (depending on how hungry your guests are and what else you’re serving!). I just found you, and wanted to say thank you for your time, sumptuous recipes and absolutely stunning photography. Instant favorite! Yum–you must have read my mind! 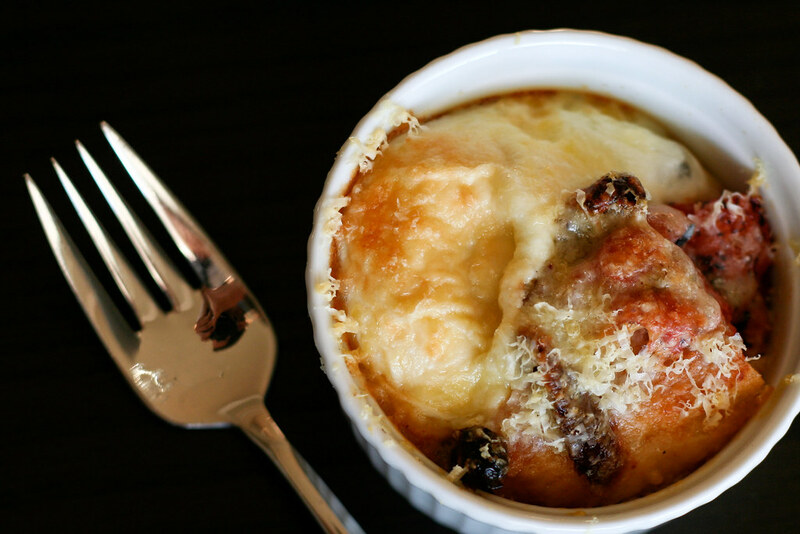 I’ve been wanting to try baked eggs, and this is clearly the recipe to try. Thanks! Thanks…made it yesterday. It was a huge success! I couldn’t find gruyere so I used a swiss. I’m going to try it again when I can get my hands on some gruyere. I love the idea of the Guamosas! And definitely love this egg brunch! My little ramekins are going to be busy this weekend! This looks heavenly. Thank you. Must try.